I love the concept of Anonymous (and WikiLeaks, Occupy, Idle No More). I’ve said this many times before but it’s worth repeating. However, as a FreeThinker who bases her opinions on reason, logic and empirical evidence, I am forced to acknowledge that Anonymous does have a fundamental flaw. That fundamental flaw also happens to be its’ greatest strength. This is a dichotomy that exists in most, if not all, organic social structures. While anonymity provides protection and security, it also opens activists up to infiltration by shady characters from state agencies and other disruptive elements. Given the type of dystopian technology available to the state, as well recent policies defining activists engaged in legitimate and legal dissent as ‘terrorists’, this fact poses a major threat to activists trying to invoke change. Recent exposures by both the Snowden leaks (mass surveillance) and the WikiLeaks Vault 7 CIA leaks, which documented the tools used for both mass and targeted surveillance, are evidence of this reality we face, as activists, in this dystopian age. So, how do we address this fundamental flaw which is also the greatest strength of Anonymous without throwing the baby out with the bathwater? Barrett Brown has found a solution for Anonymous activists. It’s called the Pursuance Project. How does the Pursuance Project address the fundamental flaw in Anonymous while still protecting its’ greatest strength, given that they are the same thing? The solution is in the flexibility that Pursuance offers in terms of opacity or transparency of the overall Pursuance (Op) as well as in access controls to task management and information sharing. 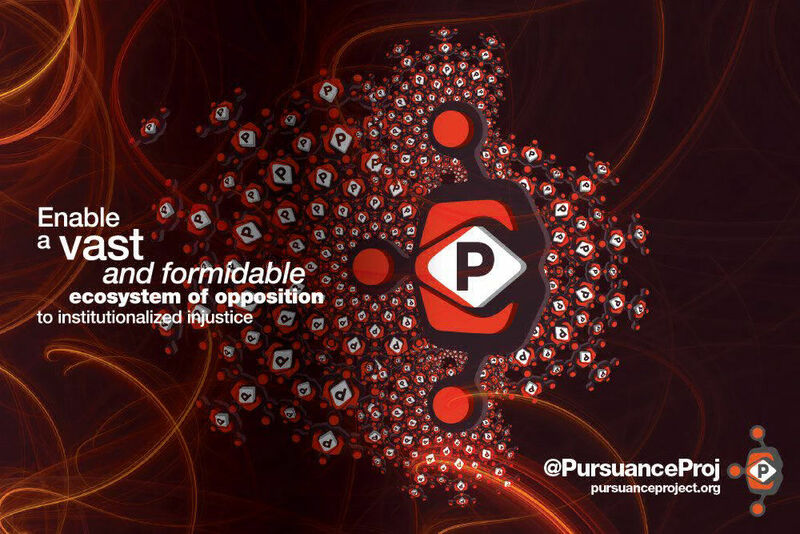 The creator of the Pursuance Op can be one person or a collective. The creator(s) can make it (or just certain parts of it) visible for recruiting purposes or completely invisible. For example, if the Op needs to recruit someone from outside their circle with special skills and providing that special skill will be their only role, it’s possible to keep most of the Op (the discussions, tasks, etc.) invisible to that outsider. The only tasks the outsider will see are those assigned to them and any segments of the Op that are public. It’s this flexible mix of options that is the real power source behind Pursuance. While the concepts of mixed opacity/transparency and access control aren’t new, what is new is the structure, the platform that they are integrated into and how they are used in social activism. The platform is zero-knowledge. No-one, including the people running the platform will have access to Pursuances, their membership, tasks, etc. unless they are made public. The platform plus the concepts built into it reduce the risk of maintaining secret identities within high risk Ops and make that risk negligible. The human element will always be a challenge because in the last few years state agencies have received billions of dollars in funding specifically for the purposes of engaging in cyberwarfare not only against other states but against their own populations. Even with technology like Pursuance, in the end, only sound decisions by activists in regard to OpSec (whatever the platform) can protect them from the high level social engineering engaged in by state agencies. Social engineering like that described in JTRIG (UK-GCHQ) will require both sound technology and sound strategic and tactical planning by the activists themselves. The reality is that when the Pursuance Project goes public they will have no control over who joins, what Pursuances they join and what tasks they are assigned. In addition, the software is open source and there won’t be any control over who downloads it and creates their own Pursuance servers. All of this control will be handed off to the activists themselves, in the Pursuances they create and the private servers they create if they choose to. Since 2012, a concerted effort has been made by those agencies to infiltrate groups like Anonymous, WikiLeaks, Occupy and Idle No More. Their main focus was to identify activists who are part of those networks and either through extortion or bribery or both, turn those once trusted activists into paid snitches. The informant communities associated with Anonymous, Occupy and Idle No More have grown immensely and we have seen huge disruptions in their campaigns, including arrests and individuals targeted for persecution. Recently the approach has changed. It isn’t about recruitment anymore, it’s about influence. The snitches are trying to expand into newer key networks and influence those networks on behalf of the feds. It isn’t the first time they’ve done this. They learned a lot from their compromise of LulzSec. Jeremy Hammond referred to this when he made his statement during his trial. After Sabu was recruited (and others – he wasn’t the only snitch), his main role was to direct Anons into engaging in Ops the feds wanted them to engage in, including overseas Ops in the Middle East. This eventually resulted in Jeremy’s entrapment with the Stratfor hack which was organized by the feds. In the meantime, LulzSec continued to be completely fed-controlled until Sabu was exposed (they may still be since the other snitches have never been exposed). WikiLeaks has been somewhat better at protecting themselves because they have already been following the concepts behind Pursuance. They just haven’t had an actual tool to ease the way. For them, involvement in Pursuance wouldn’t require a change in approach. They would simply have an integrated tool that was already designed and built with their approach in mind. Occupy and Idle No More should seriously consider going Anonymous on the Pursuance Platform. Join @kickstarter and become a Pursuance Backer. Anonymous and the Pursuance Project would make a great coupling. V: Would you… dance with me? Evey Hammond: Now? On the eve of your revolution? V: A revolution without dancing is a revolution not worth having! This entry was posted in Hacktivism, Pursuance Project by Kitty Hundal. Bookmark the permalink.